Recent release “But I Can’t Sew” from Page Publishing author Diana Hoffman is a lighthearted and engaging reflection on the achievements and failures that comprised a diverse and productive career and a valuable book of advice on recognizing and avoiding the inevitable pitfalls that will arise on any path to success. Diana Hoffman, an attorney and award-wining entrepreneur who has worked with the US government on trade missions and to forge global economic partnerships, has completed her new book “But I Can’t Sew”: an engaging and inspiring book providing insight and advice on overcoming obstacles while building a successful business or personal achievement. Diana shares, “When my son was a young boy learning to clean the bathroom, he yelled, “Mom, how do you know when it is clean?” Same thing in business or developing your career. How do you know when you are on the path to success or failure? How long do you keep persevering or working at a project? When do you cut your losses or change directions? The answer is inside this quick-read book. Published by New York City-based Page Publishing, Diana Hoffman’s entertaining and practical approach to business and/or career development provides inspiration and insight for avoiding pitfalls and enjoying the rarely-straight path to personal success. 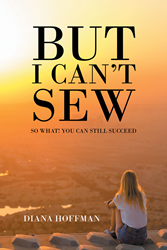 Readers who wish to experience this engaging work can purchase “But I Can’t Sew” at bookstores everywhere, or online at the Apple iTunes store, Amazon, Google Play or Barnes and Noble. Page Publishing is a traditional New York-based, full-service publishing house that handles all the intricacies involved in publishing its authors’ books, including distribution in the world’s largest retail outlets and royalty generation. Page Publishing knows that authors need to be free to create - not bogged down with the logistics of eBook conversion, establishing wholesale accounts, insurance, shipping, taxes, and the like. Its roster of accomplished authors and publishing professionals can help writers leave behind these tedious and time-consuming issues and focus on their passion: writing and creating. Learn more at http://www.pagepublishing.com.